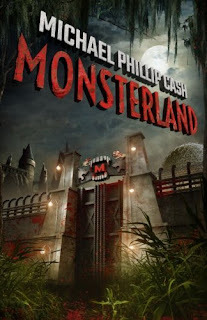 Michael Phillip Cash: Welcome To Monsterland Giveaway! October hosts a myriad of fun things to do and visit. What if one of those things was to visit a theme park full of monsters? Would you go if you were invited? 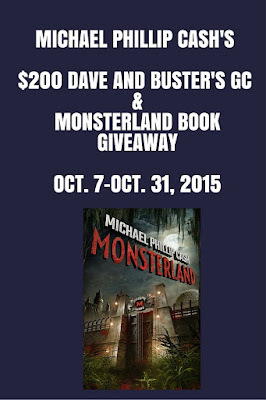 Check out "Monsterland!" To introduce this book, Michael Phillip Cash is generously giving away a signed copy of his book along with a $200 Dave and Buster's gift card for a howling good time! Enter in the Rafflecopter below for your chance to win. Good luck! Michael Phillip Cash is an award-winning screenwriter and novelist. 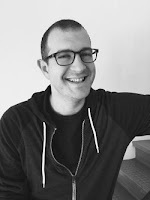 He's written eleven books including the best-selling Brood X, Stillwell, The Flip, The After House, The Hanging Tree, Witches Protection Program, Pokergeist, and Battle for Darracia series. Michael resides on the North Shore of Long Island. He writes full-time with his own screaming monsters in the background. I think the scariest monsters are those that look like normal people! I'm not quite sure what I would create, but it would rather cool to design one with a raven head, ruby lips, and sparks flying from its fingertips! If I created a Monster, it would be pale, skinny with protruding bones, lank long hair it would move from a crouched position have long fingernails that would always be scraping against the floor, walls, doors, ect. It would lurk in darkness, closets, in a dim corner, under the bed. Its purpose would be evil curiosity, it doesn't want to be seen, it wants to observe You and as close as it can when your not aware. Maybe it might want to eat you, it hasn't made up its mind yet. I hate monsters, but mine would probably look like Big Foot? I would make a super cute fluffy monster with the puppy eyes no one can resist because everyone would want to cuddle and best of all, no one would suspect he was evil. My monster would be a girl monster, really ugly, and really hairy with an extra eye!